This preliminary study aims to present the basic facts of the tragic events of the Turkish military attack/ invasion, and military occupation of 37% of the Republic of Cyprus' soil, by Turkish military forces on July 20 1974. 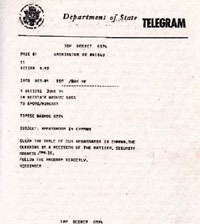 Moreover it intends to publicize to the European and International public opinion this very crucial issue for Cyprus and Hellenism, specifically the HUMANITARIAN issues of the MISSING PERSONS, the 200,000 GREEK-CYPRIOT REFUGEES, and the CULTURAL DESTRUCTION carried out by the Turkish State against Cyprus since 1974. 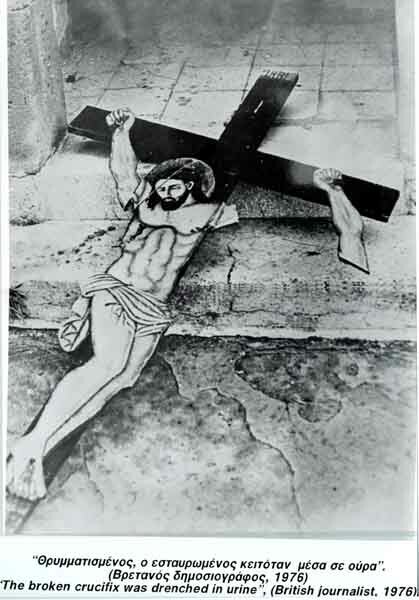 In the photo, Crucified Jesus Christ is thrown on the floor, drenched in urine by "European Turks". Turkish Muslim Mongols show no respect, not even for Holy Religious Symbols of Hellenism and of Christianity. Click photo to see the enlargement. 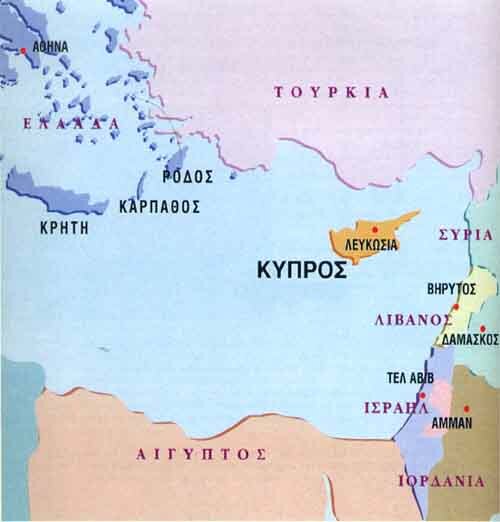 The photo above gives the "picture" of the results of the Turkish military occupation against Cyprus, against the Greek (Christian Orthodox), Armenian (Christian Orthodox), and Maronite (Christian)-Cypriots, and against Greek and Christian Orthodox existence and Greek ancient civilization in the 37% of the occupied areas of Cyprus. 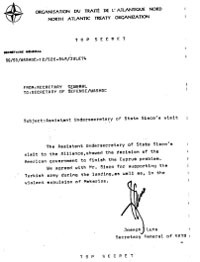 The Turkish state, and their puppets in the occupied areas of Cyprus, methodically and systematically destroy everything that is Greek from the occupied areas of Cyprus (Greek Orthodox Churches, Greek Orthodox monasteries, Greek Orthodox cemeteries, Statues of Heroes etc. ), whereas they sell in the international black market Greek Archaeological treasures of unprecedented value. 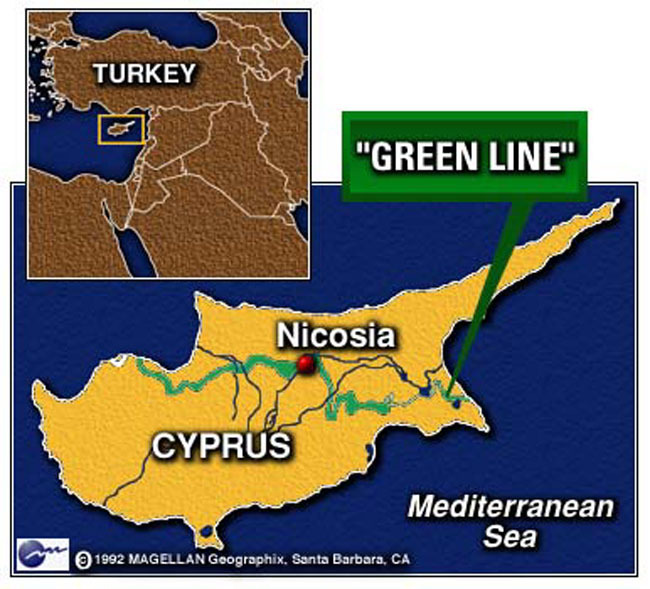 Eastern Mediterranean Sea, is where Cyprus is located, on the South Eastern border of Europe, and between 3 continents, European, African, and Asian. 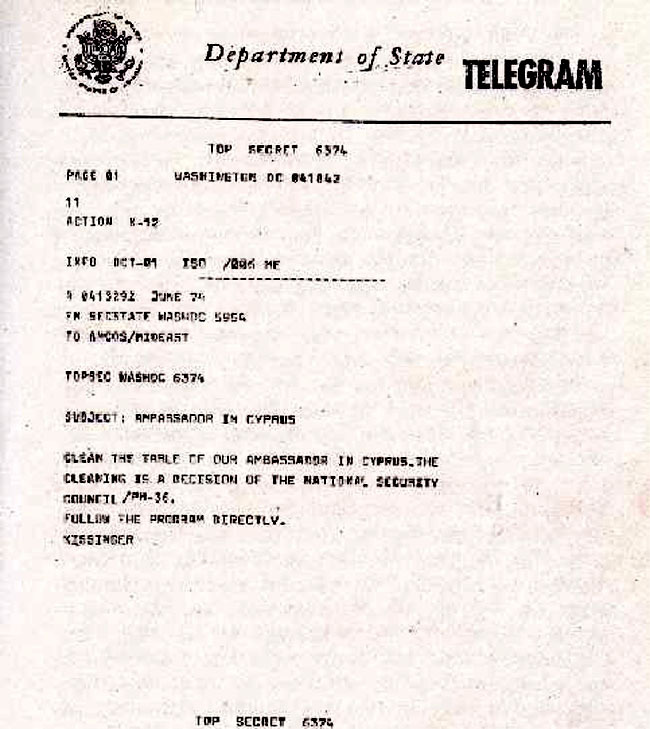 The tragic situation in Cyprus today. Despite Cyprus' accession into the European Union on May 1 2004, 37% of the island is under barbaric occupation by the Turkish army. We are all prisoners of knowledge. To know how Cyprus was betrayed, and to have studied the record of that betrayal, is to make oneself unhappy and to spoil, perhaps for ever, one's pleasure for visiting one of the world's most enchanting islands. Nothing will ever restore the looted treasures, the bereaved families, the plundered villages, the groves and hillsides scalded with napalm. Nor will anything mitigate the record of the callous, and crude politicians who regarded Cyprus as something on which to scribble their inane and conceited designs. But fatalism would be the worst betrayal of all. The acceptance, the legitimization of what was done - those things must be repudiated. Such a refusal has a value beyond Cyprus in showing that acquiescence in injustice is not 'realism'. Once the injustice has been set down and described, and called by its right name, acquiescence in it becomes impossible. That is why one writes about Cyprus in sorrow but more - much more - in anger." Christopher Hitchens, "Hostage in History: Cyprus", Washington, May 1997. CAN YOU IMAGINE THIS IN THE USA??? CLEAN THE TABLE OF OUR AMBASSADOR IN CYPRUS. 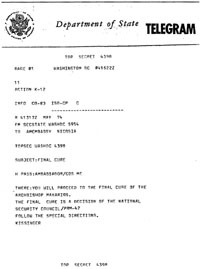 THE CLEARING IS A DECISION OF THE NATIONAL SECURITY COUNCIL /PH-36. Click images to see the enlargement. 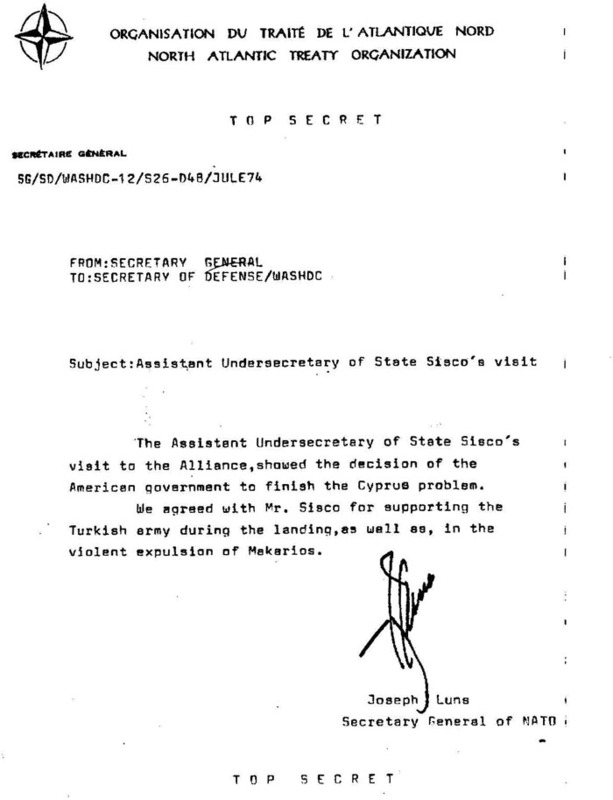 The Assistant Undersecretary of State Sisco's visit to the Alliance, showed the decision of the American government to finish the Cyprus problem. We agreed with Mr. Sisco for supporting the Turkish army during the landing, as well as, in the violent expulsion of Makarios. 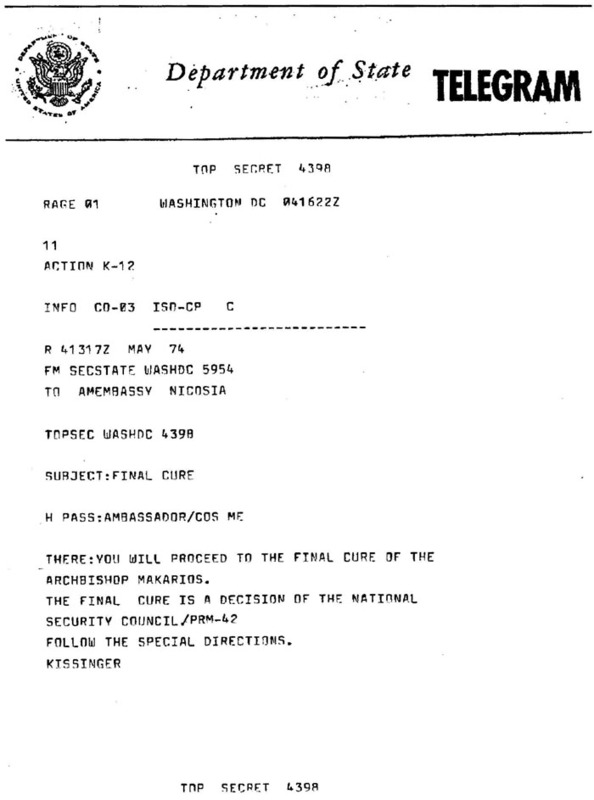 THERE: YOU WILL PROCEED TO THE FINAL CURE OF THE ARCHBISHOP MAKARIOS. Copyright Kypros-Net Inc. - Occupied Cyprus. For more information contact Kypros-Net Inc.
For Technical issues contact the Technical Support team.